I went through a period, several years back, when I listened to audiobooks and podcasts (burned onto CDs) on a regular basis. Of course, spending three hours or more in the car every day might've had something to do with that. But it was a good thing, as it turned me on to the late, great Ed McBain (a/k/a Evan Hunter) who read several abridgements of his 87th Precinct novels. After that, I made a point of reading every new McBain book until his death in 2005, and we exchanged a few e-mails, too. During a trip to London, I grabbed a couple of audio versions of Raymond Chandler's Philip Marlowe novels, and recently acquired a set of unabridged readings by Elliot Gould, who played Marlowe in "The Long Goodbye." I'd had several of "The Adventures of Philip Marlowe" radio shows on tape. None were written by Chandler, though he allegedly "approved" each script, which probably meant that he endorsed the checks sent to him. I recently discovered that almost all of the existing Marlowe radio shows are online and can be downloaded free here or streamed here. 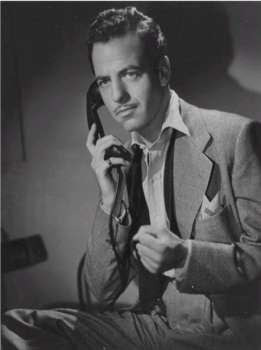 The photo above is of Gerald Mohr, who portrayed Marlowe in the CBS radio shows.